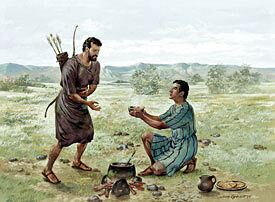 Genesis 25 tells the story of Esau selling his birthright to Jacob. The birthright itself was a tremendous blessing and responsibility. The birthright child had the duty to care for the family in temporal affairs and assume the role of spiritual leadership and presidency. Although I do not believe Esau fully understood what he was doing when he sold his birthright to his brother in Genesis 25, I do believe that later in his life he came to the realization that the birthright was significant. I do not believe it is needful to get into a discussion in class debating whether or not it was deceptive for Rebekah and Jacob to work together in helping Jacob obtain the birthright. Esau showed through his actions that he did not esteem the birthright to be of worth, and so the focus for us in class was to analyze what he did to show his lack of respect for the birthright, while at the same time emphasizing what the young people can do to qualify themselves for all of the blessing their Heavenly Father has in store for them. 1. Genesis 25:34 states, “thus Esau despised his birthright” – to me this is a “thus we see” statement similarly found in the Book of Mormon. The author of the text is now going to show us how this statement is true. Esau’s immediate needs and desires controlled his actions without much thought of later consequences or blessings – this is a natural and common human tendency. We addressed this in class and had the students analyze when they have let their immediate needs take precedence over long term consequences. How do you correct this natural tendency? Seeing things as they really are takes effort and the Spirit. Using the scriptures as a guide, the youth can learn the lessons from those in the past and gain insight into how their actions have long term consequences. When Esau returned and discovered that he lost his blessing, “he cried with a great and exceeding bitter cry, and said unto his father, bless me, even me also, O my father… Hast thou not reserved a blessing for me?” Isaac replied with love for his son, “What shall I do now unto thee, my son?” The story continues, “And Esau said unto his father, Hast thou but one blessing, my father? Bless me, even me also, O my father. And Esau lifted up his voice, and wept.” (Genesis 27:34-38). When we devalue the birthright in our youth, we open ourselves up to the possibility of losing Heaven’s choicest blessings long term. There are many examples of shedding the tears of Esau in the lives of our youth. I asked several classes if they have stories from the lives of their families where individuals have made choices that they later have come to regret. Any time we put our temporary, immediate concerns in the place of long range gospel centered goals, we are in jeopardy of shedding Esau tears. One such story that I experienced happened several years ago. I was walking to my car in the morning heading to the seminary when a gal I knew in the apartment complex I lived in sat on the stairs crying. I visited with her for some time listening to her dilemma. She was married with two children to a man who was not a Christian. This man had forbidden her to raise the children as Christians due to his faith prohibiting this. When she was courting him, this did not seem to be important. Raised in a faithful Latter-day Saint home, she should have listened to the counsel of her parents, but at the time she believed she knew what was best. Many years later, shedding the tears of Esau, she asks, “Hast thou not reserved a blessing for me?” Her life and the lives of her children are on a course charted by a decision that she made in her youth. Of course there are times when things change and course corrections can be made, but for many of us we face critical moments in our lives when our choices affect our ability to receive the blessings our Heavenly Father so much wants to bestow upon us. Paul, commenting on Esau’s choices, stated, “Afterward, when he would have inherited the blessing, he was rejected: for he found no place of repentance, though he sought it carefully with tears.” (Hebrews 12:17). Paul is not saying that there is no hope or repentance for Esau, but that he lost certain blessings that even tears could not bring back. This entry was posted in Old Testament and tagged applying Genesis 25-27, blessings, Esau, Jacob, LDS seminary, LDS youth, regret, relevance of the scriptures, seminary teaching ideas. Bookmark the permalink.